The dance scene in Paris is very rich. There are so many theatres and festivals that you have to keep your eye on the ball in order not to miss the big shows of the season. I am personally more interested in contemporary dance and I usually begin to put red marks in my diary when Theâtre de Chaillot and Théâtre de la Ville, two big cultural institutions of the city, announce their new seasonal programmes. Among the shows I saw at the beginning of the summer, let us highlight one, seen in Chaillot, for its sense of poetry, its technical sophistication and the absolute originality of its purpose. Luc Petton is an unusual choreographer in the contemporary field. After a career as a dancer he worked as a choreographer and founded his own company Le Guetteur (The Watcher) in 1994. 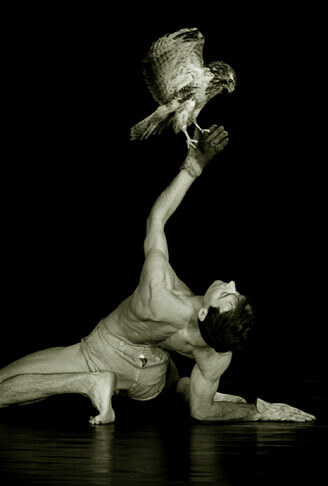 10 years later, taking inspiration from his passion for ornithology, Petton began to work on a beautiful and magical idea: to allow dancers and live birds to meet on stage. The dream came true with the creation of his show La Confidence des Oiseaux (The Birds’ Confession). Lasting an hour and a half (in theatre) or less (an outdoor version has been successfully played in parks), this show is jawdroppingly inventive as dancers are evolving with trained birds ranging from starlings to crows, budgies, jays and magpies. The result is stunning, not only because the animals are trained, the dancers are really good (I think about the various and original lifts). Music is an integral part of the show with Xavier Rosselle’s original score performed on stage. It is important to make the distinction – you’re not at the circus, all in this is pure poetry, the dancers are at the mercy of the birds, they must adapt to their avian partners thoughout the show. The dancers also have a proper (and beautiful) role, sometimes without the birds but always perfectly synchronised. As it is not circus but art (sorry, circus is an art too but I talk about the lion-jump-in-the-fire kind of thing you may find in old-fashion circus show), the scenery and costumes are simplicity itself (a stark stage, dark brown and grey body paintings on the naked torsos of the dancers) and a few accessories help such as perches (both on the set and on the dancer’s backs). But most of all the choreography plays with the human body as the ideal perch for the birds. They flood the stage with such ease and insouciance (look out for the starlings washing and preening in the water bowl) you would think this is natural, and Luc Petton is right to think that the similarity between dancers and birds rest with their facility of movement. Their existence is committed to movement, and once they’re out of sight it is only then you realise how beautiful and ephemeral it was. A new way to feel space, a new way to see the world; those are surely the main keys to understand this marvellous moment of poetry in movement.